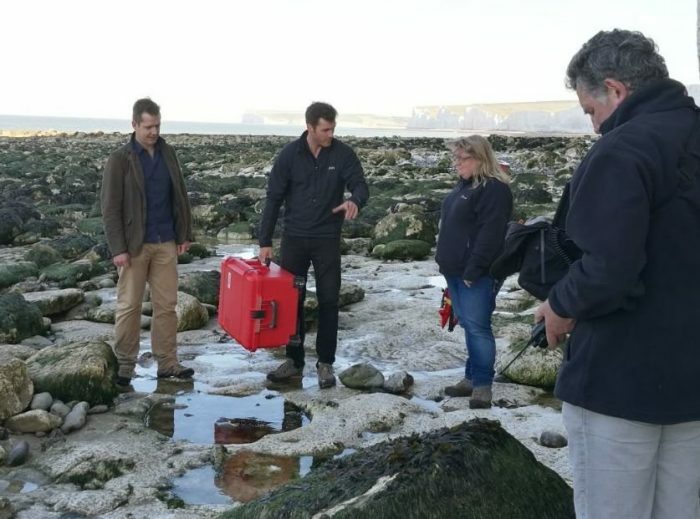 Dr James Cole, Principal Lecturer in Archaeology, and Dr Hannah Wood, Senior Lecturer in the Built Environment and Civil Engineering, both from the University’s School of Environment and Technology, carried out laser scanning of cliffs at Birling Gap near Eastbourne. Dr Wood said the scanning provided accurate measurements regarding what could be a possible Bronze Age well shaft. Dr Wood and Dr Cole joined members of CITiZAN for the research. CITiZAN highlights the threat to coastal and estuarine archaeological sites, most of which have no statutory protection. CITiZAN received funding for the six-part series from the Heritage Lottery Fund, with match funding from The Crown Estate and National Trust and further support from Historic England. Museum of London Archaeology hosted the project with the Council for British Archaeology and the Nautical Archaeology Society, with funding from Heritage Lottery Fund, the National Trust and the Crown Estate. This entry was posted in Construction, News, Research, Uncategorized.